However, that situation is about to change. Clever Brains of MIT and Berkeley have devised a display technology that makes the screens adjust as per your eyesight so that you see a clear image without the need of wearing glasses. Wouldn’t it be great if you can use your devices without the hassle of your spectacles? In this digital era, where displays are ubiquitous, the ability to interact with displays is an everyday necessity. In some cases, it becomes part of your job and being unable to do so may cost you a living. Especially when it becomes difficult to have a contact lens that fits, say, for people with higher order aberrations and thus irregularities in the shape of the cornea. The research team is positive and passionate about the possibility that this research could help millions of people with eyesight disorder and can increase employability. The technology works using a combination of software and hardware. The software alters the image based on the viewer’s eyesight condition where as the hardware is a specialized filter set in front of the display. The technology predicts how the users’ eyes will distort whatever is on screen and correct it beforehand by altering the light from each individual pixel and passes it through a small hole in the filter, so when each ray of light hits the cornea of the user it accounts for the distortion and creates a sharper image on the retina. The overall design of your stock website is what adds to the visual appeal and increases usability. There are numerous ways to make web design a priority, but adding stock icons is one of the most effective methods available. These icons have the ability to easily increase communication with online users and ensure that those people brought to your stock site actually continue reading the content that is available. These icons are designed specifically to visually appealing and increase engagement with the viewing audience of your website. Icons are a growing web design trend because they help to physically make your content more readable. This is done by breaking up content effectively in a way that makes your website easier to read and browse through without being bombarded by information that is not presented in an ideal way. Icons have the ability to get an idea across to online users in a second without the need for actual words. These interesting icons are also great for online users that have some language barriers. Communicating with your online audience is made easier through the use of various stock icons. A symbol has eth ability to creatively communicate any idea or concept with ease. Now the personality of your stock website can shine through all thanks to stock icons that add a personal touch to web design. What Matters Most When Choosing Icons? When you are looking for the most effective icons for your stock-related website, you should only choose from icons that are widely understood. Icons are only effective if they are known for clearly identifying the message they are trying to communicate. It is never a good idea to choose icons that are not commonly recognized or understood, because they will fail to effectively communicate to online users. It is also important to choose stock icons that are consistent with the design of your website. They should be able to fit in seamlessly and offer a style that goes with the overall design already in place. This means that you should choose from a wide variety of ready-made cliparts to give yourself more options. These clean and accurate icons can change the overall look of your site and add something new that was missing. A website without icons is simply not complete and not up-to-par with what online users expect and desire. Android APK Image Extractor makes it easy for designers and Android developers to pull images from APK files. Requiring no Android SDK and no Java libraries, the tool is perfect for avid designers who do not want to learn Android’s diverse SDK, install Java runtime or struggle with the command line. In an ideal world, a single APK file would contain all the graphics we want. Not so in real life. Nested multi-volume APK files are common with larger applications, requiring a different approach to how you handle them. But not if you use Android APK Image Extractor! With this little tool, handling nested and multi-volume APK files is a breathe. Android APK Image Extractor automatically processes such files, displaying all images available in them in no time. A simple tool should be just that: simple. Android offers a built-in APK Manager tool with its SDK, but it’s simply not for everyone. Native Android APK Manager requires you to install the complete Android SDK, which in turn requires Java runtime. And even then, all you get is a command-line tool with many cryptic parameters. Android APK Image Extractor is nothing like that. Being a completely stand-alone tool, it requires no Android SDK, no Java libraries and no command-line parameters. With Android APK Image Extractor you’re getting a small, tidy window allowing you to pick an APK file, choose images to be extracted, and specify the location to save the files. Bingo! You’re done with the job and can now move on. 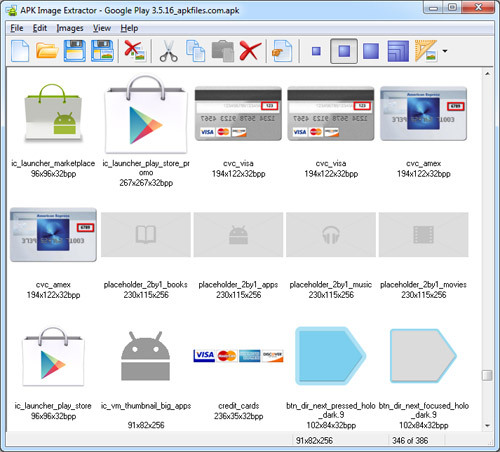 With Android APK Image Extractor, developers can process APK files to extract individual images or sets of images. Extracting PNG and JPEG pictures from an APK file is as easy as opening the APK with Android APK Image Extractor and choosing the images to pull. If you have multiple APK files to process, Android APK Image Extractor will automate the processing by extracting images from each file into a separate folder. The tool saves a great deal of time compared to manual extraction. 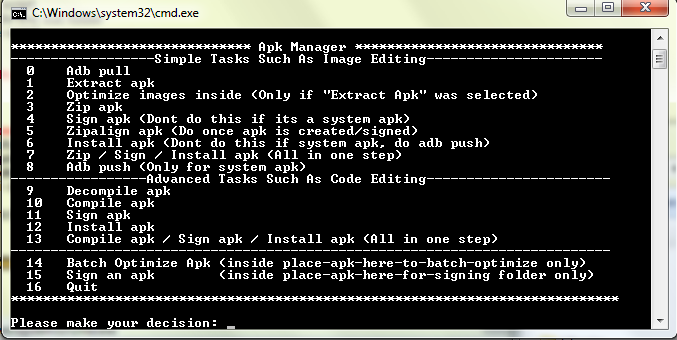 Unlike APK Manager, Android APK Image Extractor does not require Java or Android SDK being installed. The tool is completely self-contained, and offers an intuitive graphical user interface instead of the command line used by Android’s default APK editing tool. Whether you are a professional icon designer, software developer or simply like to customize your desktop and folders, you will love this icon editor. Make icons and cursors with IconLover, manage icon libraries, and import icons from various image formats. Save time using batch conversion operations. Enhance your images with sophisticated effects, a multi-layer design model and support for Windows 8/7/Vista. IconLover 5.34 can export icon captions to text files. We released the following free icon sets. Free Icons and A New Year Gift From Aha-Soft. and a truly joyful 2013! You can get 2 idividual icons from our stock icon sets for free. which are ready for evaluation. discount using NY2012SUB discount coupon. Windows SmartScreen Prevented An Unrecognized App From Running. A lot of users who tried to download and run new software products got a problem because Windows 8 shows “Windows SmartScreen prevented an unrecognized app from starting. Running this app might put your PC at risk message” while launching the program. The SmartScreen protection feature in Windows 8 is responsible for the above message. Microsoft has extended the SmartScreen feature of Internet Explorer to Windows as well to protect users from malware. In general, SmartScreen Protection shows the above message when you try to run a newly released program or an application that has not yet established a reputation. Even though one can easily disable the SmartScreen Protection feature in Windows 8, we don’t advise you turn off the protection. Step 1: Double-click on the program that you want to run or install. When you receive the above mentioned message from SmartScreen, click on More info link to see publisher’s name and app file name. Step 2: Now click on Run anyway button to run the application. That’s all! Users who would like to disable SmartScreen feature can follow the following instructions and disable noizy Windows 8 SmartScreen protection. The latest Windows 8 OS includes a number of new features that help improve your overall experience when using Windows 8 computer. One such feature is Windows SmartScreen. Windows SmartScreen alerts users before running unrecognized programs downloaded from the Internet. When you try to run certain type of programs or apps that are rarely downloaded, Windows warns with “Windows SmartScreen prevented an unrecognized program from starting. Running this program might put your PC at risk” message. If you are sure that the downloaded program is safe, you can continue by clicking Run Anyway button. But Windows SmartScreen can be irritating at times. It actually blocks software that are safe to run. For instance, when I tried to run a program named PWBoot from a well known site, and it was blocked by SmartScreen. Users who would like to get rid of SmartScreen protection can follow the instructions given below to disable it. Step 1: Open Action Center. To do this, right-click on Action Center icon (the flag icon) in notification area (system tray) and select Action Center. Step 2: In the left pane, click Change SmartScreen settings to open Windows SmartScreen dialog. To disable the feature, tick the last option named Turn off Windows SmartScreen and click OK button. Get the perfect icons for you windows mobile and complement your applications with a collection of these amazing icons to make your system look all the more snazzy. The best part is, that all of these 135 icons come for free, there isn’t much more you can ask for now, can you. Read on to know more. Making your applications look cool and hip was never this easy. Most people end up sacrificing navigation and functionality while trying to add that extra amount of niftiness, but that all changes when you make use of the new windows metro icons. A few facts about these to begin with- the icons have a size of 48 by 48 pixels, which includes a circle along with an image of size 26 by 26 pixels centered within. These PNG files have a transparent background, and can be uploaded with or without the circles. Available in black and white colors, they are compatible with windows mobile as well as windows 8 operating system. By using these icons in your projects you can ensure an enhanced level of interactivity for the app. Easy to understand, being descriptive and yet good to look at, they have absolutely everything going for themselves. You can artistically place them in just the right places and save yourself the trouble of writing many many lines of code while also avoiding the clutter it may otherwise result in, and the best part is that you can acquire and use them for free. Be it for your music player, or just a new image for the recycle bin, a brand new folder icon, or just something new to replace the good old clear tab, this is packed full of unique icons for everything you can possibly think of. The 135 icons covered in this particular set, cover every fathomable need you may have as far as images for applications may be concerned. It is time to go back to being a native and resorting to using of images all over again, because they’ll make using your system so much fun that you would never want to go back to all of those boring interfaces ever again. Rather than developing these icons for need, they have been constructed for the sheer desire to be creative. More than what you may require, these include icons you may have to invent a need for. These icons, as mentioned previously, are compatible with your windows 8 operating systems as well as your windows phone. Keep it simple, keep it cool, keep it snazzy and make applications and interfaces interactive. Research says that people understand one image better than a thousand words, and everything lies in the description. By using these you’ll never fall short of description, surprise users by allowing them to look at things in a new way, all that and more can be achieved easily when you are using our favorite icons. Take a look, trust me, you wouldn’t have to search long for places where you can fit them it. The content management system or CMS is the set of processes that have used to handle work flow in the mutual surrounding. These processes can be using both in the computer based or manually. Basically, the procedures are used for the various designed! These processes are permitting huge number of people to offer and distribute stored data. With the help of these processes, you can easily manage to access the data that have based on the roles of the users. In this way, important information can edit, publish, and view by a single or group of user. It is also helping for easy storage as well as recovery any data easily. You can also get the opportunities to decrease repetitive replica input. These processes are also helping you to develop the ease of statement writing. However, CMS is developing the statement between users. These processes can be definite as almost anything such as: pictures, phone numbers, movies, and documents. The enterprise content management system is documents, content, records and details related to organizational processes of the enterprise. Purpose and result is managing organization’s unstructured info content, with the diversity of format as well as location. System manages content associated to the commercial organizations. The web content management system is the CMS made to simplify publication of the web content to sites and mobile devices -particularly, allowing the content creators to make, submit as well as manage the contents without needing any technical knowledge of Web Programming Languages and Markup Languages like HTML or uploading of the files. Many web based content management exist in an Open Source and commercial domains. Web content management system is similar to WCM, with a main difference to be fulfillment of specific requirements.